Today there is evidence that the light emitted by the PSiO glasses is no danger and is, to the contrary, useful to regulate sleep / wake cycles, more commonly known as ‘circadian rhythm'. 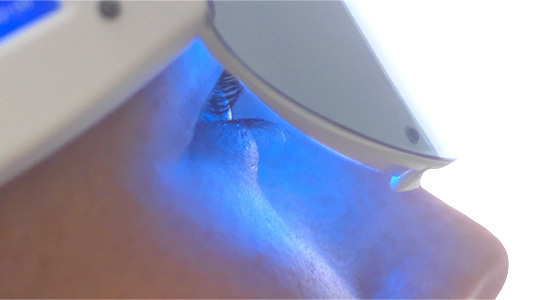 Several rumors and press articles directed against the LED Industry have indeed mentioned in the past a dangerous potential regarding the blue tones of LED lighting, and it was legitimate to ask whether the colored lights emitted by the PSiO were dangerous to human eye, especially for people with macular degeneration. Today, this is no longer relevant. The French National Measurement Laboratory (LNE) has produced a certificate of total safety to PSYCHOMED. French researchers have indeed observed that the harmfulness of the blue tones does not depend on the luminous intensity and that the toxic band is narrow and corresponds more precisely to light wavelengths between 415 and 455 nanometers. The wavelength used in the PSiO diodes is 470 nm, which implies that it does not enter the band mainly incriminated in this study. The use of PSiO occurs at minimal doses (5 minutes to 30 minutes / day maximum on average) compared to studies like this one, using prolonged exposures (up to 6 hours in a row). Finally, in 99% of the cases, the PSiO sessions are done, after 10 minutes, eyes closed. The layer of the skin thus provides additional protection to the retina. Nature has equipped our body with sensitive receptors to this wavelength to indicate to the biological clock when it is day and when it is night. This process of stimulating the retina is therefore natural. This wavelength (470 nm) is mainly that of morning light when the sky is clear. A manufacturer of optical glasses, the Essilor group has also set up a type of glass to filter the "bad blue " or ‘violet blue' and ultraviolet frequencies. Those glasses also maximize the transmission of "good blue " (which is essential to chronobiology) while maintaining the transparency of glass (Crizal lenses Prevencia). Arnault E, Barrau C, Nanteau C, Gondouin P, Bigot K, Viénot F, et al. (2013) Phototoxic Action Spectrum on a Retinal Pigment Epithelium Model of Age-Related Macular Degeneration Exposed to Sunlight Normalized Conditions. PLoS ONE 8(8): e71398.